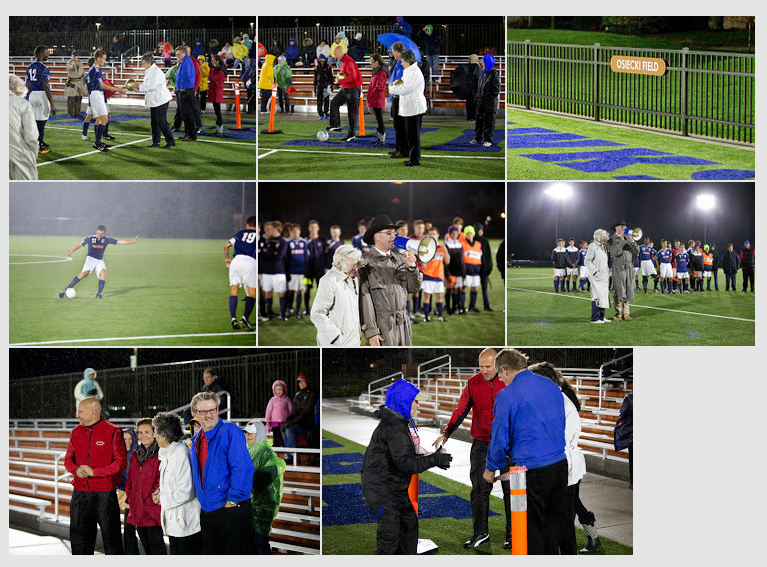 The Prairie School’s new, state-of-the-art Osiecki Soccer Field and Ketterer Goal was officially dedicated on Tuesday, October 14. The new field and goals were made possible through the vision, leadership, and generosity of a number of donors throughout the local community – especially Jill and Chris Osiecki and Brian and Denise Ketterer. Prairie’s new soccer field is the centerpiece of the Ruud Family Soccer Complex, and has been designated a “certified level two” playing surface by the Federation International de Football Association (FIFA) – the internationally renowned, Zurich-based governing body for rules and standards pertaining to the sport. Significantly, Prairie’s new field is the only FIFA – 2 level high school soccer field in Wisconsin. The Osiecki soccer field will provide important benefits to Prairie and the surrounding communities – including increased playability, fewer injuries, the elimination of pesticides and fertilizers, and lower maintenance costs. Prairie’s boys varsity soccer team claimed a 10-0 victory vs Salam. Join us this coming Thursday, October 23 as our Boys’ Varsity Soccer team competes in the WIAA sectional game against St. Catherine’s High School at 5:00 p.m.
We look forward to recognizing our other donors during the girls spring soccer season and at the alumni soccer game on June 7.